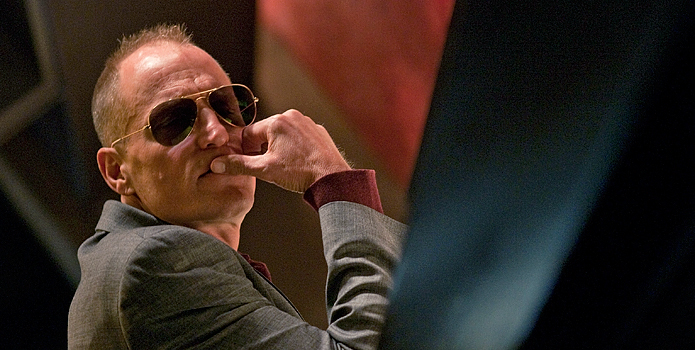 Woody Harrelson is front and center in Oren Moverman’s “Rampart”, playing Dave Brown, a Los Angeles cop. We meet him in the familiar role of the uncompromising veteran, hazing a rookie officer and beating information out of a man in custody. He has the respect of his peers, although he displays it in an unusual way, quoting obscure (and possibly invented) legal precedent to paperwork-shuffling colleagues. This is typical of his silver tongue, which we are treated to often. He is a wordy, funny and indignant conversationalist, especially when challenged, and the best moments in the film are his verbal spars. And he gets plenty of them, with a broad parade of women, lawyers, associates and antagonists. Brown has two daughters, one by each of two sisters (Anne Heche and Cynthia Nixon), and all five live improbably together under a single roof: if anyone could have talked themselves into such an unusual arrangement, it would be someone with Brown’s gift of gab. Yet he is capable of violent and vengeful anger. His troubles begin when his cruiser is sideswiped and he beats almost to death the offending driver. The act was somehow videotaped and is broadcast all over the news. Brown’s question is: why was the camera there? Was it a setup? In a different movie, he might have tried to find out, maybe discovered something, but here we aren’t even allowed to know whether there are any sinister motives at all. Brown doesn’t pursue it as any more than a paranoid accusation, and so instead we see only him as he goes on the defensive. The script is by Moverman and James Ellroy, but there is no “L.A. Confidential” intrigue here. I found it difficult to tell who was doing what to whom – if anything – which is a little frustrating, but I suppose Brown is going through the same thing. The crucial question then is what drives Brown. He is not “Dirty Harry”, getting results and to hell with the rules: he is not getting results. We see him do no police work, unless the early “enhanced interrogation” counts. He is challenged throughout his increasing turmoil – by Sigourney Weaver’s desk cop, by the lawyers he looks to retain as his troubles deepen – to explain why he has to stay a police officer. Why not go quietly? His answers are never convincing. He seems wedded to a notion of himself as a solider and the job as a war. But he is also broke, and maybe that explanation is the best. He certainly is highly protective of his unconventional family and seems to want to provide for them. While embroiled in the mess from the videotaped beating he seeks out a tip from a retired cop, a friend of Brown’s father, about a card game he can rob. The trouble goes from bad to worse as Brown’s plan goes badly awry, and his circle of suspicion expands. Harrelson shows Brown’s smooth-talking, in-charge swagger give way easily to pathetic desperation, with Brown hustling for money and scattering wild accusations. His words that were so impressive are useless or forgotten. At no point does he seem willing or able to really investigate what, if anything, is going on, not so much a dirty cop as just dirty.